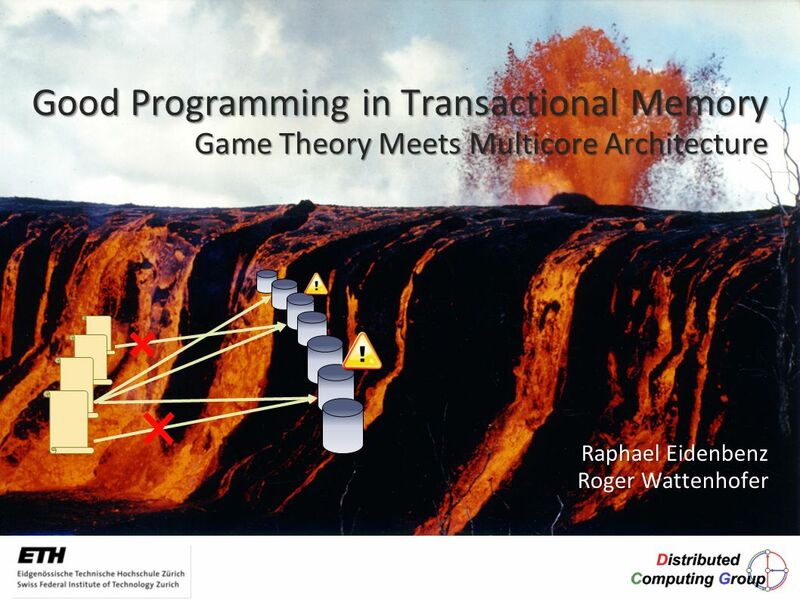 Raphael Eidenbenz Roger Wattenhofer Roger Wattenhofer Good Programming in Transactional Memory Game Theory Meets Multicore Architecture. 2 Raphael Eidenbenz, ETH Zurich. 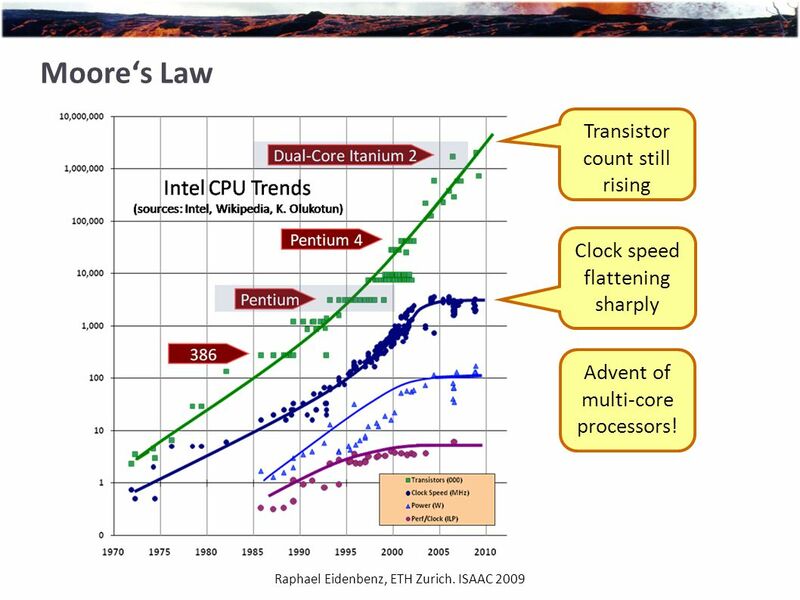 ISAAC 2009 Moore‘s Law Clock speed flattening sharply Transistor count still rising Advent of multi-core processors! 4 Raphael Eidenbenz, ETH Zurich. 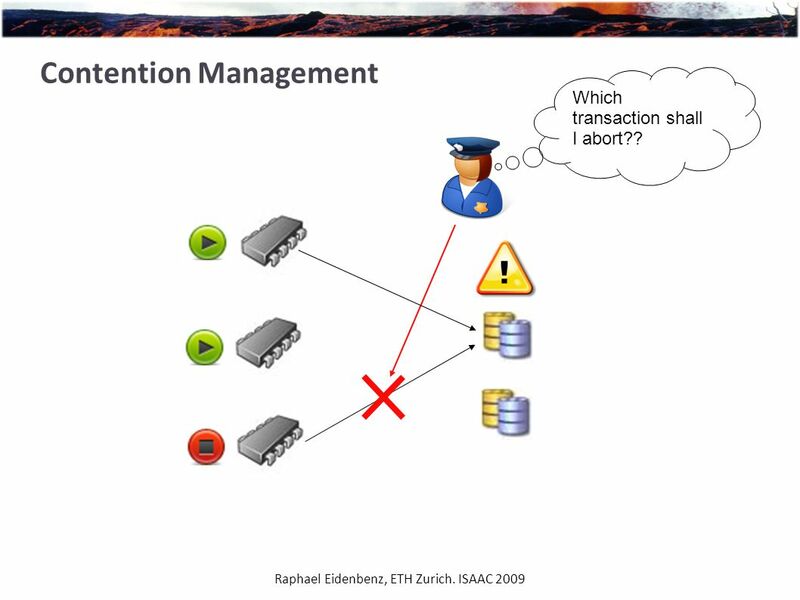 ISAAC 2009 Contention Management Which transaction shall I abort?? 11 Priority Based CM  CM associates with each thread J i a priority ! 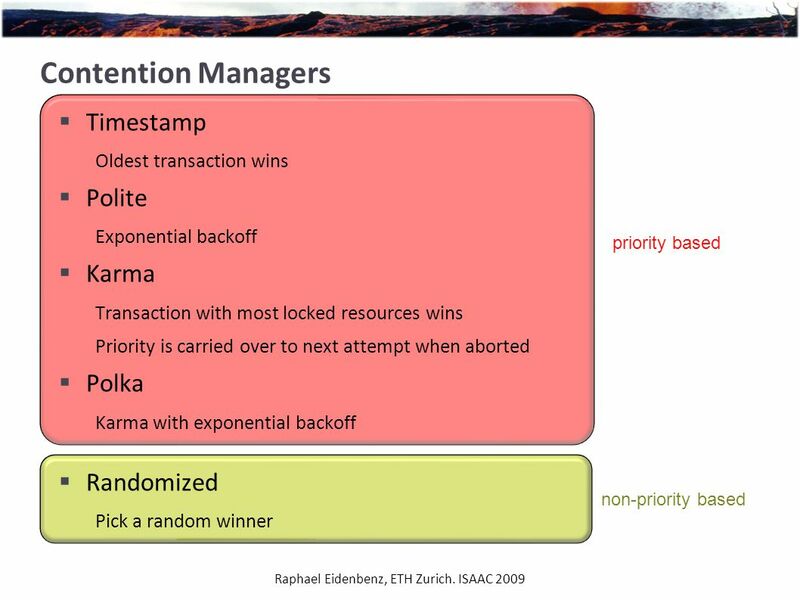 i  Thread with highest priority wins conflicts  Rationale: „Don‘t discard the transaction who has done most“ Underlying assumption: Priority measures the amount of work done  E.g. 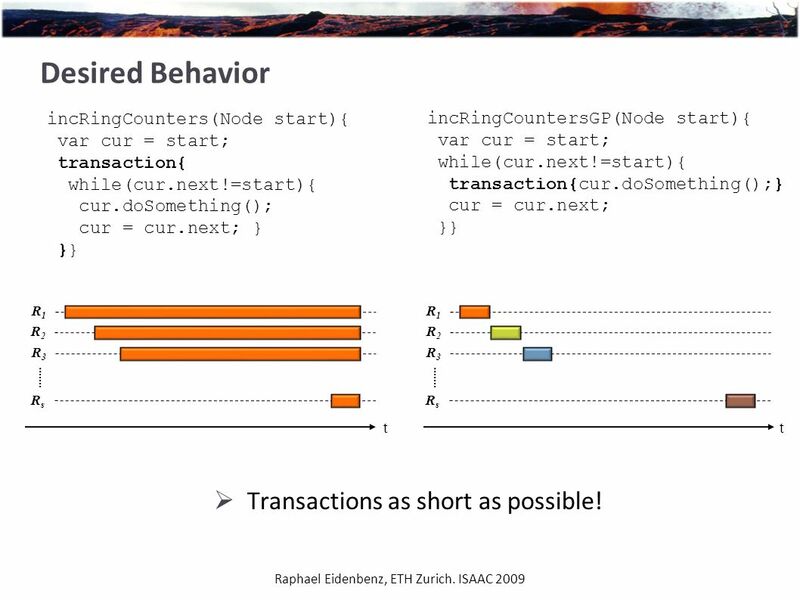 Timestamp CM The oldest transaction has done the most work Raphael Eidenbenz, ETH Zurich. 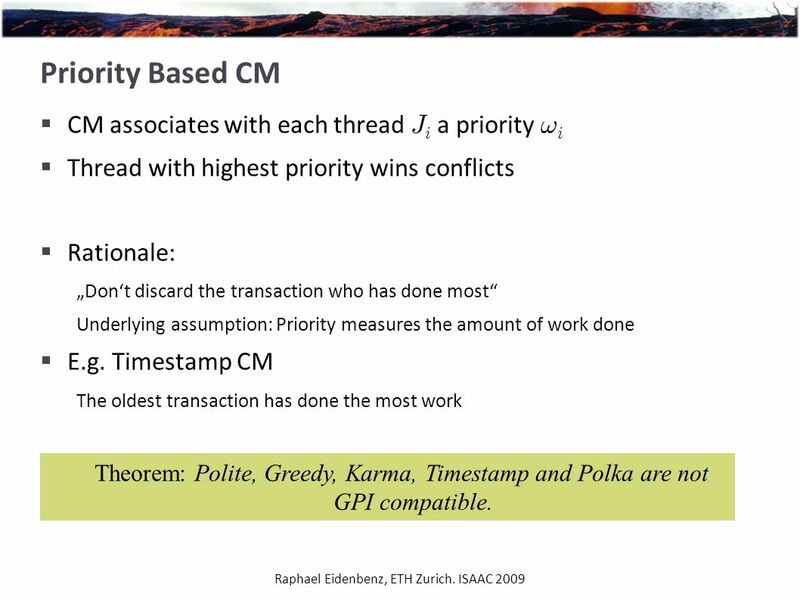 ISAAC 2009 Theorem: Polite, Greedy, Karma, Timestamp and Polka are not GPI compatible. 14 More Results Raphael Eidenbenz, ETH Zurich. 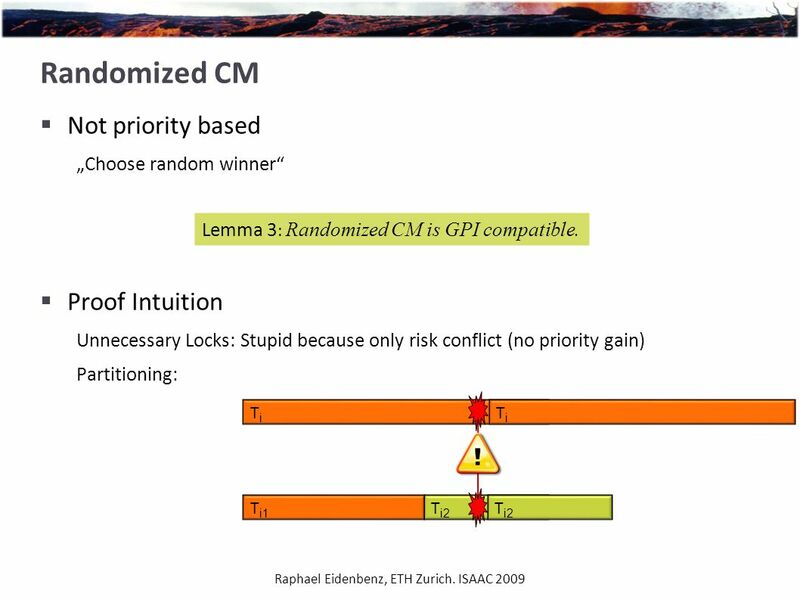 ISAAC 2009 Theorem 3 : Any priority-accumulating CM M is not GPI compatible if one of the following holds: i.M increases a job’s priority on  -events. 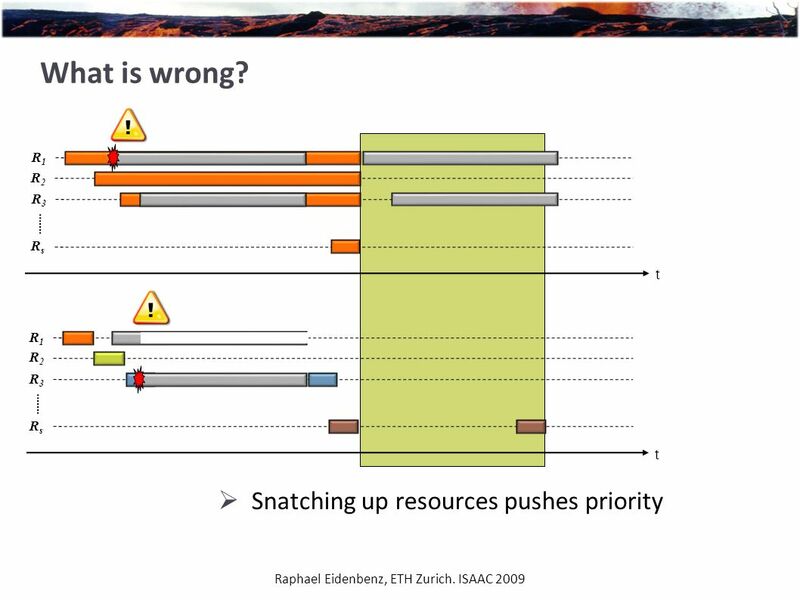 ii.M increases relative priority on  -events. iii.M schedules transactions gapless and increases priorities on  -events. 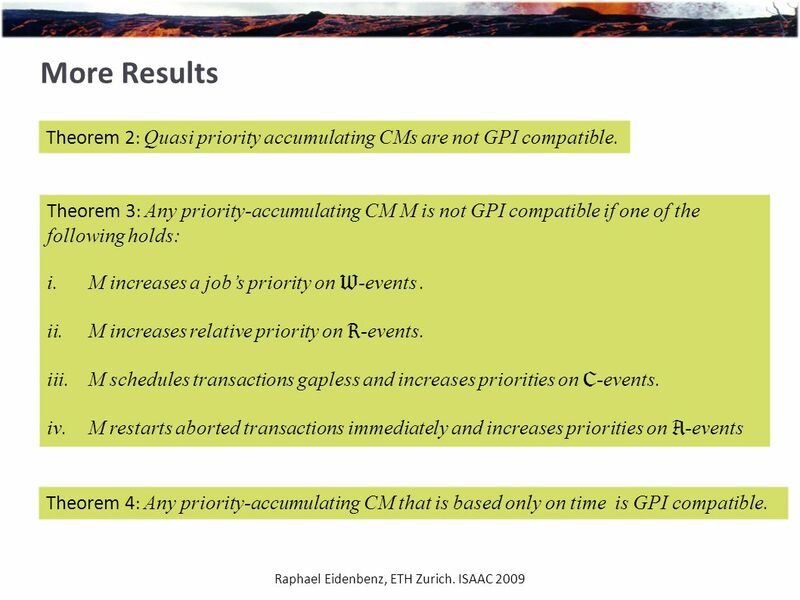 iv.M restarts aborted transactions immediately and increases priorities on  -events Theorem 2 : Quasi priority accumulating CMs are not GPI compatible. 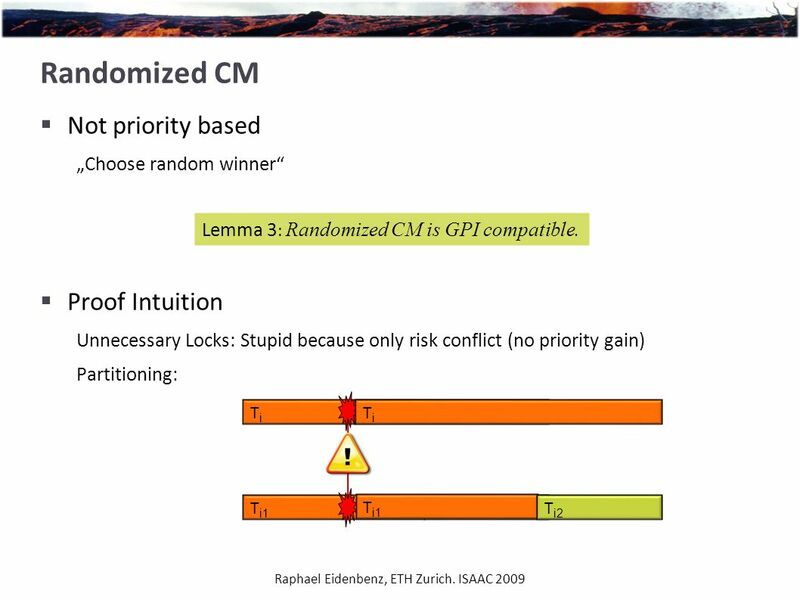 Theorem 4 : Any priority-accumulating CM that is based only on time is GPI compatible. 17 Raphael Eidenbenz, ETH Zurich. 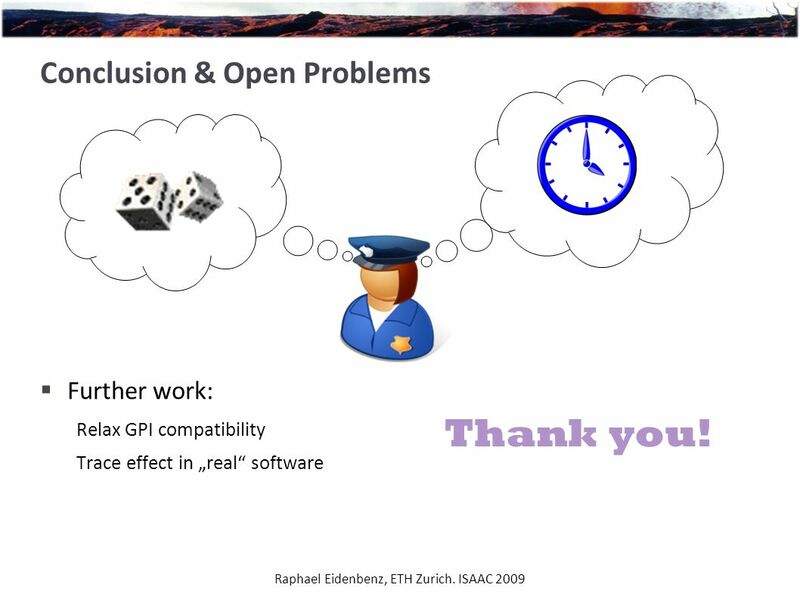 ISAAC 2009 Conclusion & Open Problems  Further work: Relax GPI compatibility Trace effect in „real“ software Thank you! 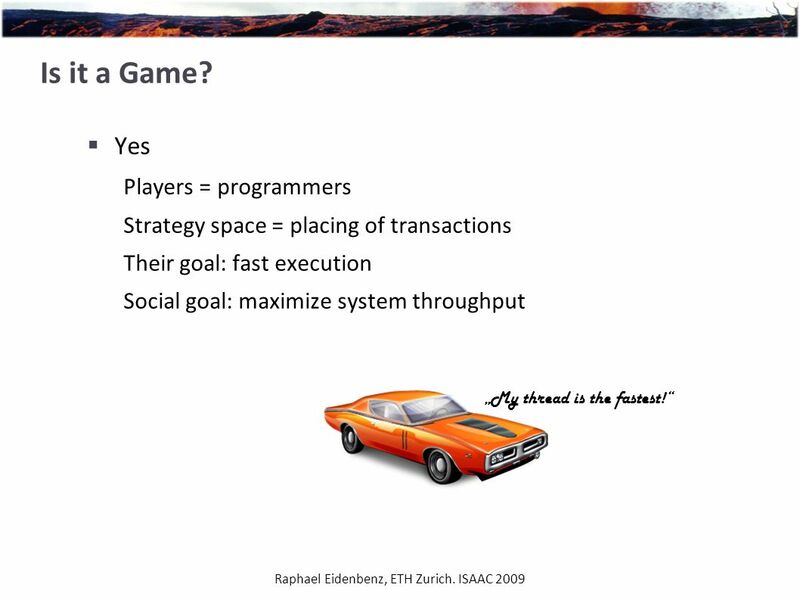 Download ppt "Raphael Eidenbenz Roger Wattenhofer Roger Wattenhofer Good Programming in Transactional Memory Game Theory Meets Multicore Architecture." 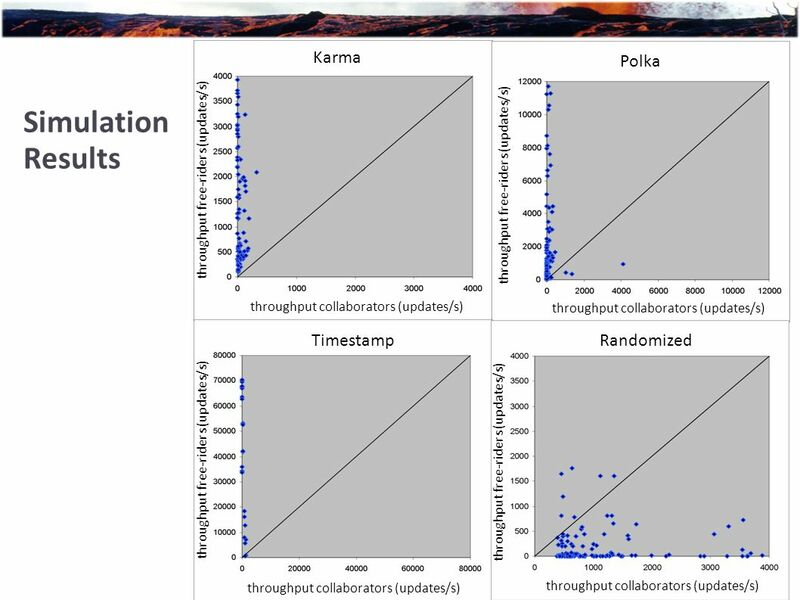 Enabling Speculative Parallelization via Merge Semantics in STMs Kaushik Ravichandran Santosh Pande College. Is SC + ILP = RC? Presented by Vamshi Kadaru Chris Gniady, Babak Falsafi, and T. N. VijayKumar - Purdue University Spring 2005: CS 7968 Parallel Computer. 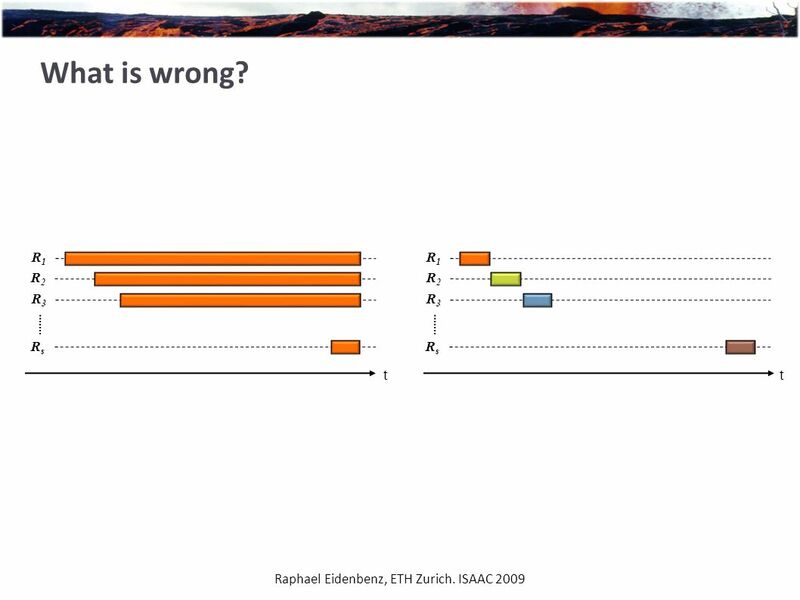 Silberschatz, Galvin and Gagne  2002 Modified for CSCI 399, Royden, Operating System Concepts Operating Systems Lecture 19 Scheduling IV. Thread-Level Transactional Memory Decoupling Interface and Implementation UW Computer Architecture Affiliates Conference Kevin Moore October 21, 2004. 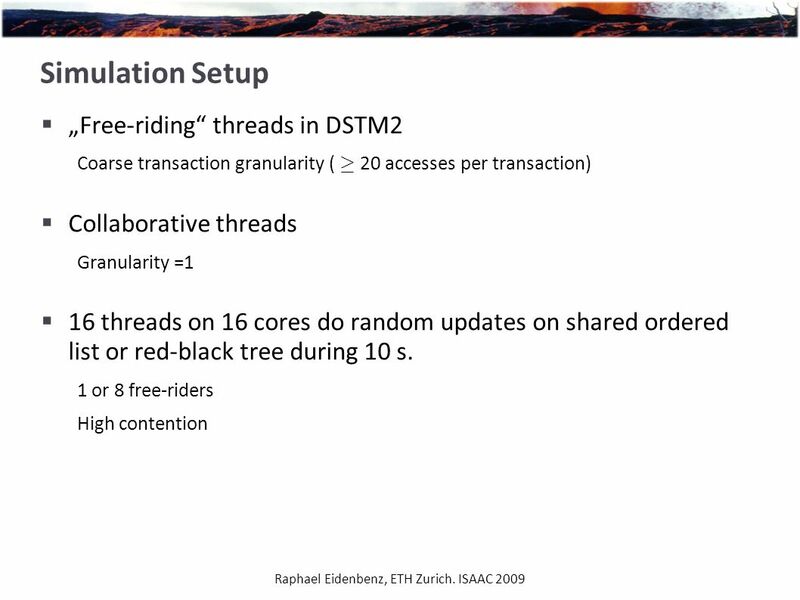 Nested Parallelism in Transactional Memory Kunal Agrawal, Jeremy T. Fineman and Jim Sukha MIT. Transactions are back But are they the same? R. Guerraoui, EPFL. 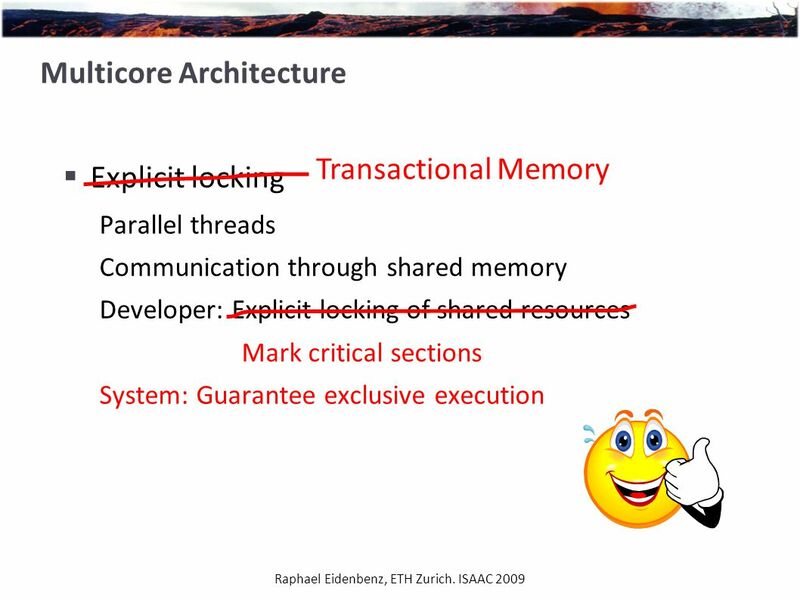 PARALLEL PROGRAMMING with TRANSACTIONAL MEMORY Pratibha Kona. Presented by: Ofer Kiselov & Omer Kiselov Supervised by: Dmitri Perelman Final Presentation. 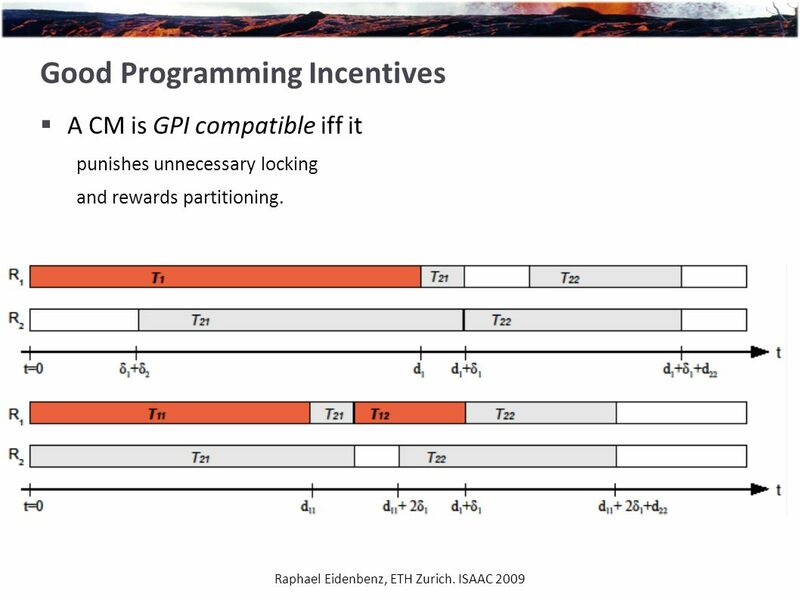 TOWARDS A SOFTWARE TRANSACTIONAL MEMORY FOR GRAPHICS PROCESSORS Daniel Cederman, Philippas Tsigas and Muhammad Tayyab Chaudhry. Submitted by: Omer & Ofer Kiselov Supevised by: Dmitri Perelman Networked Software Systems Lab Department of Electrical Engineering, Technion. CSCE 668 DISTRIBUTED ALGORITHMS AND SYSTEMS Spring 2014 Prof. Jennifer Welch CSCE 668 Set 8: More Mutex with Read/Write Variables 1.